This thread is to provide info on Korat Chef's products and services. We have a shop in Nakhon Ratchasima City (AKA Korat). All products are made my Korat Chef using the highest quality ingredients available. We've been in business for just over one year and have recently expanded our business by opening a shop and commercial size kitchen. Our shop is located at 357 Suranaree rd, Nakhon Ratchasima city. That is next door to the George & Dragon pub, and near to San Sabai hotel, near Tokyo mansion hotel. It's about 300 metres from the old bus station, (not the large new bus station near Big C). I've attached a map. Last edited by KoratChef; 15-08-2012 at 06:15 PM. Not too far from Roiet. Looks well worth a trip. Nice Banner. We have a large range of Western & International foods. We can arrange delivery or come by the shop to pick up. Below is a price list of most of our products. Some are made fresh and change often so it's better to ask which we have available when placing your order. Well done and nice set up. It might be time to move back to Isaan. That's going to be bloody fantastic for farangs living up that way. I will be there to check out your food - sounds good. I only live abt 15 klms from the Mall. I should mention shop hours. We open 9am-10pm 7 days a week. I'm currently having some issues with some ribs. Don't suppose you could deliver the entire Indian menu to Thong Lor? It is possible as we do deliver. Unfortunately I doubt it'd be there in time for your dinner time today. We do send deliveries to many provinces. We use the local bus companies here in Korat which cover a fairly extensive area. They travel to most places in North, NE and Central and others parts and even Pattaya. We put the goods in foam boxes with dry ice and the customer can collect from their bus station. We do need some time to arrange this. For example if someone in Bangkok or Udon Thani wanted a delivery. If we received the order on Monday the customer could expect it Tuesday. Sounds fantastic. Well done again. This will be a fantastic asset to those living in the region. Do you have a dinning area there or is all carry out? We don't currently have a dining area. It is something we'll be adding in the near future. We'll also be adding a sandwich bar. We've just created a new price list. It has all our latest products. Will you ship anywhere in Thailand? At the moment we rely on the bus companies for deliveries between provinces. This is a reliable and relatively cheap method. It may be limited to where the bus companies in Korat travel to. We haven't yet tried sending somewhere that the buses in Korat didn't go to directly. There are delivery companies that will deliver anywhere in Thailand but I'd think it would be more expensive but it is possible. This is similar to curry sauce from English Fish & Chip Shops. Others may know it from it's Naval history, or from the Japanese style curries. "Western-style curry draws its influence from stews mixed with curry powder, which were popular amongst the British Navy. The Imperial Japanese Navy adopted curry from the Royal Navy, and now the Japan Maritime Self-Defense Force's Friday menu is curry rice." Looks like you have a decent menu there at very fair prices. Well done. Any members tried the products yet? 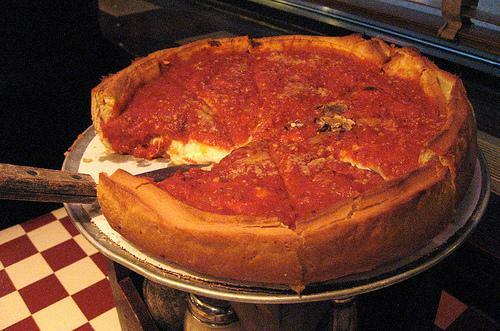 Any chance of you whipping up some deep dish pizzas? Did you really have to post a picture of that! Your food and menu sounds fantastic Korat chef! That may be something we'll do once we have the sandwich bar and deli section finished. We are going to have seating in the evening outside the front of our shop. Then people will be able to try our food without having to prepare it themselves. He's in a prime location in Korat too. I suggest this business will do more than merely float. So far so good Somtamslap. We have a long way to go we realise, and getting new businesses off the ground is hard. But we're giving it our best shot! Thanks for the interest in what we're doing.